Tring, Berkhamsted, Aldbury, Wigginton, Ashridge, Northchurch, Hastoe, Long Marston, Wilstone, Potton End, Frithsden. Aston Clinton, Dagnall, Edlesborough, Pitstone, Wendover, Halton, Cheddington, Marsworth. See Area Covered. At CMW Window Cleaning We use the most up to date window cleaning equipment and technology utilising water fed poles and 100% pure water cleaning. This cleaning technology is proven to be the most effective and efficient way of cleaning windows and ensures the highest standard of service for all of our customers. We aim to offer the most comprehensive window cleaning service in Herts and Bucks, we also clean conservatory windows, garage doors and Upvc fascias. CMW Window Cleaning Services are fully insured and guarantee the highest standards of service and equally competitive pricing. We clean all frames, sills and doors as a standard. We are a professional reliable domestic window cleaner offering local window cleaning for your home and commercial businesses throughout Tring, Berkhamsted and further afield. If your area is not listed above please ask us, as we can most likely accommodate you. 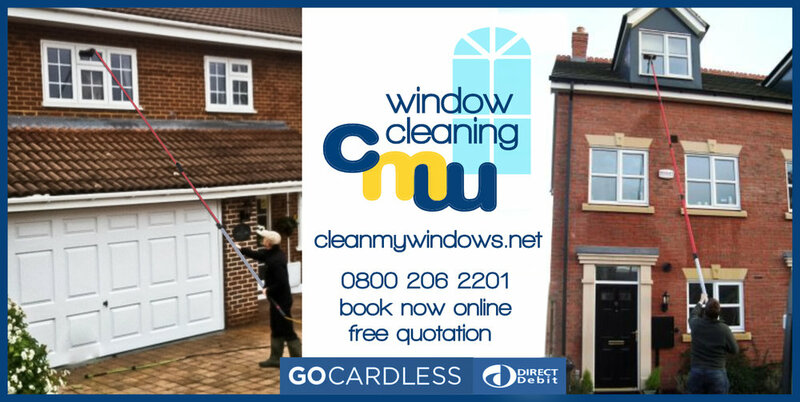 Find out about CMW Window Cleaning and our superb Pure Water Cleaning System.